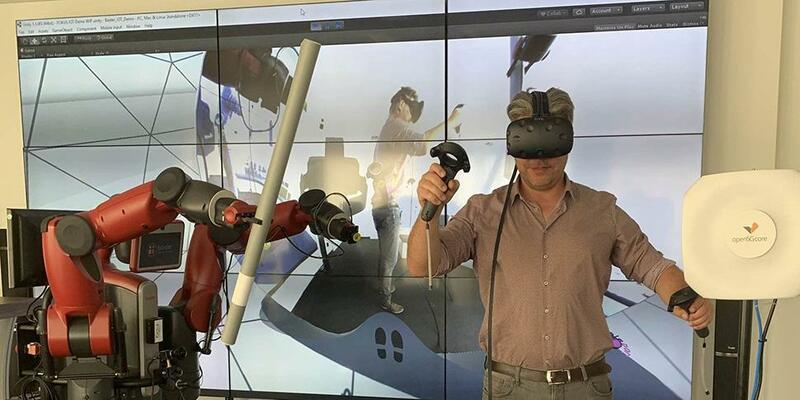 Using Virtual Reality (VR) glasses and two VR controllers, visitors of the German Edge Cloud GmbH, a new enterprise of the Friedhelm Loh Group, will be able to remotely control a two-armed industry robot via radio cells connected to an Edge-based 5G core network. The scenario illustrates how in the future private campus networks can be operated and used at production sites for low-latency, near-real-time applications using Edge-based, standards-based 5G core networks. In order to grip and move objects with robot arms by remote control, people must be able to realistically estimate the depth and distance of objects and the robot arms. FOKUS researchers in the Visual Computing business unit have developed an application that uses two fisheye cameras to stream the robot's 360° x 180° surround video in stereo 3D into the VR glasses. Due to the stereo 3D property of the live video, the viewers can gain a realistic perspective of the robot. The Open5GCore of the Software-based Networks business unit is used for the network infrastructure. The Open5GCore is one of the world's first standards-based and manufacturer-independent 5G core networks. The demo is a first showcase of the cooperation between the German Edge Cloud and Fraunhofer. The German Edge Cloud is an Artificial Intelligence Edge Cloud for real-time Industry 4.0 applications. Visit the German Edge Cloud (GEC) demo on the Rittal booth in hall 11 E06.